This entry was posted on Sunday, April 17th, 2011 at 20:18	and is filed under Uncategorized. You can follow any responses to this entry through the RSS 2.0 feed. You can leave a response, or trackback from your own site. Looks like your first off the bat with this one, looks like a great start! Do you think in future builds that the shairport source files might be included? Yes, I’m thinking about including the shairport repo as a git submodule. Building hairtunes could also be done by the Xcode project, maybe in a script or as a target dependency. Still have to have a way to install libao and the perl dependencies, though. This was quick and dirty…but that’s some good advice. Thanks! Hmm… It doesn’t seem to work here – on neither of my machines. Same problem, the app lanches, but whenever I turn the server on, it seems to be activated for a brief moment and then it goes gray again. You probably have to ensure that shairport / hairtunes can run standalone. Specifically, there are two perl modules and a library described at the shairport github site. In a future update, it would be nice to include that step, perhaps as an installer…but for now this is just a GUI wrapper. Try the updated version. You will still have to add the necessary perl modules described at https://github.com/albertz/shairport but the hairtunes bit should work. Running a pre-release OS and you’re looking for a tutorial “for dummies” :) ? In brief, no you don’t need to install ShairPort separately, but you need to have the perl dependencies installed as described at the ShairPort github site. I included a compiled copy of libao, but it may not work (at least it didn’t on my work computer). Thanks for the report; I’m thinking of changing to using the Cocoa port of ShairPort to eliminate the perl deps and all. A +1 thanks for some great work, and interest in a MacShairPort version of this menulet. Though MacShairPort also needs a little work to be completely reliable, but in the longer term it certainly makes sense as the foundation for your menulet. Thanks! That’s exactly what I have been looking for in the last few years! It would be even better if you can bring this to iOS! I really want to use my old iPhone 3G and over armv6 iDevices as wireless IEMs! Tell me Why when I start to streaming from my iOS device to the Shairport quits suddenly? Probably because it crashed, but it’s difficult to tell without the crash report. If you wanted to provide it, you could get it through the Console.app. I don’t think it is specific to your wrapper but an error of the ShairPort itself. I’m running 10.6.7.
robert: this works fantastically, thanks! 1) use CPAN to install the perl module Crypt, and after that, Crypt::OpenSSL::RSA (explicitly). 3) install libao using homebrew — the homebrew-specific path to libao is hardcoded in the build’s copy of Shairport, is why you should use homebrew, specifically. yes. After a couple of hours of trying and failing to install from the shairport source I found this – brilliant work, thank you. 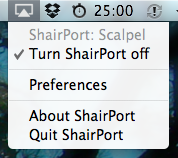 Do you know if shairport can be run at startup with “Shairport on”? Shairport crashes against an iPod 4th gen with iOS 6. I’m on 10.6.8. Can I ask for an update? Your app is the best, simplest and free solution out there.